Don’t Forget – Today is Amazon Prime Day! 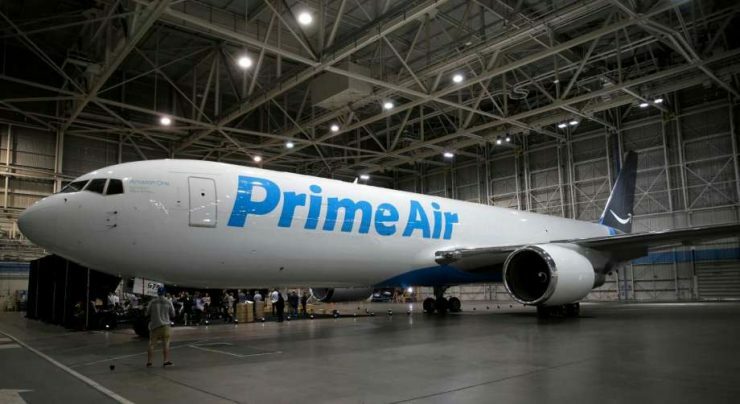 Note: This is a scheduled post – and I will make every effort to update it as new Amazon Prime Day updates become available, more so in the first half of the day, as I’m on the other side of the world at the moment. You will certainly want to keep tabs on your pricing. I suspect that some resellers will be dropping prices to undercut. Autopricers will no doubt be the a pain today. But with the additional traffic, this may also be the time when you monitor your sales and see whether you can eek out a few extra dollars, because no doubt there will be a great many consumers looking for a great deal, as well as looking for things that they might not have realized they needed until Amazon offered a suggestion. One caveat: As you are identifying products to source — as we never stop sourcing (kind of like Glengarry Glenn Ross), be wary of rankings on Amazon Prime Day. I suspect that the metrics will be very questionable, given promotions and specials. Amazon has set up a handful or resources, including the Amazon Shopping App, and the Amazon Facebook Page. You can of course continue to monitor Amazon’s website for the lightning and goldbox deals. I wish I had further insight but I don’t – I can tell you that Amazon has been soliciting sellers selectively, and asking for rather significant discounts, I could throw out percentages, but I won’t. I’ll just say that the deals should be good, but they will go fast. That was the biggest complain last year. So if there’s something in particular that you have your eye on, set an alert on the Amazon App. Whether you’re a reseller who has hopefully gotten your stock into an Amazon Center and are looking to maximize this Christmas in July, or if you are a consumer looking for the latest deal, Amazon Prime Day is for you. It will be exciting to watch! Are there any products you are looking at for Amazon Prime Day? Changes coming for Amazon’s FBA Fees in Q4! If you’re an Amazon Seller, you probably got an e-mail. If not, you can read all the gory detail of the changes to FBA fees in this post, or in the source article. Like I said, not a huge savings, but something of a positive, since for the most part, I think we are all looking for a very quick sales velocity during the forth quarter. Starting 1 November, 2016, Amazon will start penalizing those that don’t provide box content information. In fact, it was September of last year, that Amazon came out with an incentive for early adopters. I seem to think that they meant to require box content a whole lot sooner than 14 months later, so its not a huge surprise. Quite honestly, its not even a big deal, in my view, especially if you aren’t doing multiple boxes. If you are, its maybe a couple extra minutes. Again, nothing groundbreaking. And if that extra couple minutes is too much effort, Amazon is happy to charge you an extra $0.10 per unit January to October, and $0.15 per unit in November and December. Seems like a fair deal to me. Amazon exports as a CSV file, but if you open the folder, you can select “Open With” then select Microsoft Excel. The key parts are in red, namely, the age of your inventory. Obviously, you want to make sure you have enough inventory that you aren’t missing out on sales, but, that you’re not paying storage fees. There’s obviously some give and take, so you have to decide which you’re more willing to do – accept storage fees, or missed opportunities. If only it were that simple! Obviously competition plays into this too, but that is a post for another time. Amazon’s announcement today isn’t unexpected. Quite simply, I figured it would’ve been much worse. Clearly FBA Fulfillment Centers have been reeling from a ton of slow moving inventory, so the fact that FBA fees are only raising the little they are, seems like we kind’ve dodge a bit of a bullet. It will certainly make things awfully interesting in November and December, when every day will matter (as if it didn’t before), and hopefully these increased fees and lower handling fees do not backfire and increase the amount of time from sale to ship. Time can only tell. Are these increase fees surprising to you? Will they change your strategy for Q4? Reselling Roundup – Ungating, Virtual Assistants, Portal Points, and EBates Birthday! So far, these little Saturday reselling roundup specials have been well received, so we’ll keep them going for a few more weeks at least. I’m hearing consistently that it has been harder and harder to get ungated in grocery and health and beauty, among other categories. 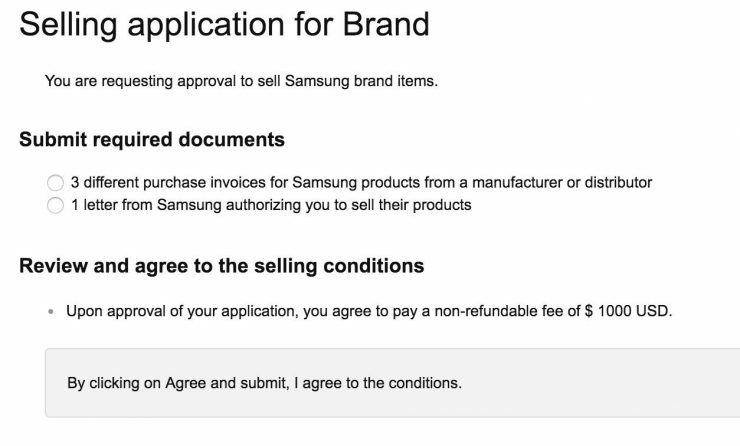 The bad news is, Amazon is not taking invoices from online only wholesalers anymore, the good news is, this link has some suggestions for successfully being approved. If you’re like me, you’re running out of time to do all the things you need to do. Especially if its a side-gig. Ryan Grant offers some suggestions for hiring a virtual assistant for online arbitrage. I’ve also been trying out Fancy Hands (which I learned from Jeanne), if you’re interested, here’s my link. If you’re looking for a way to get more United Miles, Oren reports that MPX has added Ebay Gift Cards! Ebates’ Birthday is next week – Time to plan to go big (or go home? But please, just plan to go big!) Miles to Memories has a sneak peak of the list, but I’m still hoping to see Staples added to the list at game time! 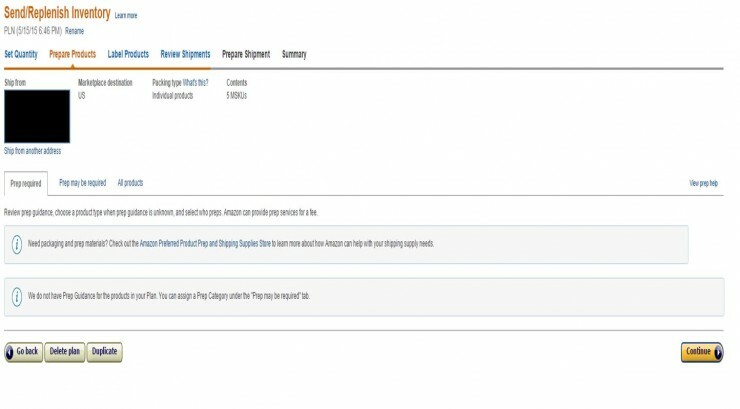 Inventory adds the ability to add a second account – great for scaling up! Public Service Announcement (PSA) Always add a product to inventory before you buy! PSA – Remove Meltable Inventory from FBA now! If you’ve gotten into reselling recently, you may not know that Amazon doesn’t permit any meltable inventory from May 1st to September 30th. If you’ve been doing this a while, and knew this, well, a reminder never hurts, right? 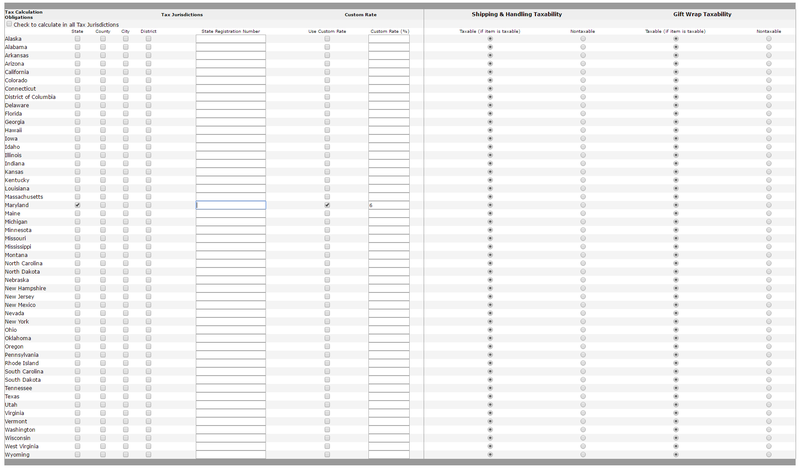 So here’s your reminder: Remove meltable inventory from FBA now! Yes, you have a couple of days, but, lets be honest, the prices are dropping faster than manufactured spending opportunities. There is no silver bullet to identifying meltable inventory. The easiest answer is to go through your inventory – you likely have a pretty good idea of what is and what isn’t. Chocolate – that’s a no brainer. Cosmetics? Could be. Toys? Probably not. The general rule of thumb is – can the product withstand being stored in 100 degree temperatures? Oh no! I have unsold Meltable Inventory! What do I do? The good news is that if you identify your meltable inventory before 30 April, your removal fees will be nil! In fact, even if you don’t have anything that will melt, now is the time to determine slow or non-selling products for removal! Amazon is waiving removal fees through 30 April It doesn’t hurt to do an assessment of your inventory to see what just isn’t moving as fast as you may have previously anticipated. This is just a good time to take stock (pun intended) of your inventory, both for meltable inventory, and also for slow moving inventory. Its definitely a great idea to leverage Amazon’s free removals until 30 April. As far as other inventory that you might be pulling back, other questions to consider might be: Could it sell better in Q4? Do you have the room to store it for a few months? Or if it might not sell, can you still return it? Every little bit can help. Some argue that you have Nexus anywhere that Amazon stores your products–and that’s not just those Amazon Fulfillment Centers (FC) that you ship to, since Amazon moves inventory around. I won’t go into the issue in much detail, except to offer what I do, which is collect, report, and pay sales tax in my home state. Every state is different, when it comes to registering to collect sales tax. TaxJar (This is an affiliate link, thank you in advance for your consideration) has a good tool for what State and Local Sales Tax is required. I will caveat that for my state, Maryland, the information is not 100% up to date, as the Amazon Fulfillment Center has been open for nearly a year. You need to update your tax settings in order to start collecting sales tax on amazon. 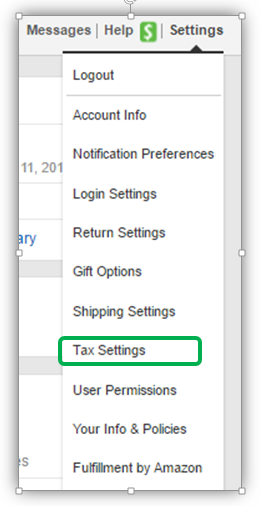 You’ll want to click “View/Edit your Tax Calculation Obligations and Shipping & Handling and Gift Wrap Settings. 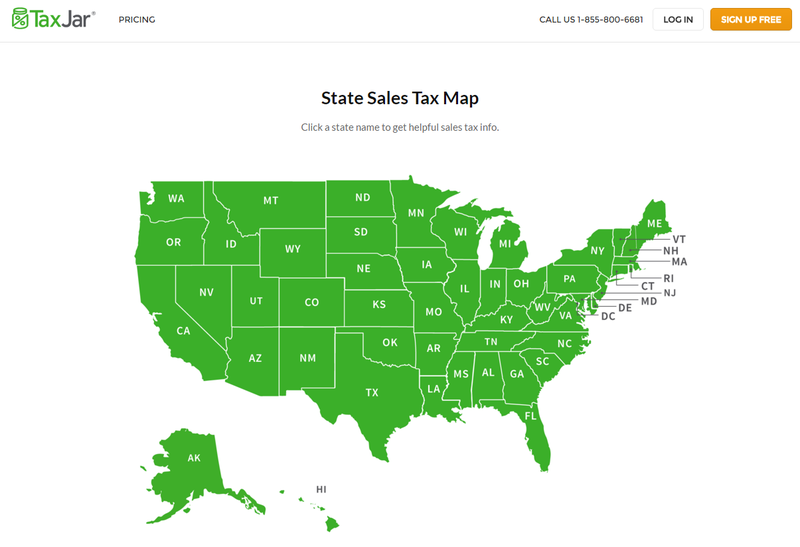 Scroll down and you’ll see where you can enter your state’s sales tax, as well as your State Registration number. They give you the choice to also calculate based on County, City and District. I understand some states, you need to do that in, but I am no expert. You can see here, I selected Maryland, and put in the 6% tax. Make sure you hit the checkmark to acknowledge and agree that your state tax registration number(s) are correct. You’ll get the same screen as before, but this time, stating “Confirm everything is correct”, then you will get a second confirmation for Tax Calculation Services Set Up. 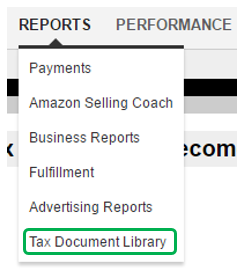 When you do load the report, it will identify those transactions that are taxable. From that you can determine what taxes you need to pay to the State. Again, I won’t advocate of a particular approach to collecting sales tax. But, if you do decide to do so, I hope the tools I have provided, are sufficient to empower you to do so. If there is one thing I hope from this post, it is for continued conversation. So please, share your opinion in the comments. I have had quite the backlog from what is informally referred to as “Returnuary“, and invariably, I found a lower cost product, a Brother PT-D210 label maker. Well, yesterday, I finally got to that lovely little label maker, only to open the box and notice that the customer didn’t return everything. Take a look for yourself and see if you can identify what is missing. Ok, I won’t hold you in suspense any longer – Its the power adapter! Of course, I’m looking at this and thinking to myself: Why would someone steal a power adapter? But it makes perfect sense. They are specific to a limited number of units, why buy a new one for $9.99, when you can buy a new label maker, take the adapter, and send the rest back in for a full refund, right? Well, first of all, it is common sense. Anytime you get something from Amazon, you should inspect it, to make sure all parts are there, and that it is legitimately what you sent in. If you do commingled inventory, well, you might get a mishmash of things, but if you do non-commingled inventory (which I recommend), then you should be getting the same product you sent in, back. Of course the simplest answer is often the right one. Document what is missing, document the return / removal documentation, including, if there was a removal packing slip, and then submit a case to Amazon. Much like asking for a gesture of goodwill, you want to keep things short and to the point. When I get around to submitting a ticket, I’ll likely go short and sweet, here’s the product, here’s the removal order, here’s what’s missing and approximate value. That’s it. Returns are part of the game whenever you resell. But, returns should be in good faith, in that the products should have all the necessary pieces included. When they aren’t, its incumbent on the seller to highlight what is missing. Amazon usually does a great job at making a seller whole. Its a shame, because I’m not sure that they actually go after the buyer. Far too many times, I’ve had buyers do things that span the gambit between absent mindedness, like this case with the PT-D210, and outright stealing, such as a case where a product was returned pretty much stripped to the plastic, even a motherboard was missing. So my advice: Always inspect returns, and do it very soon after you receive them. You should have between 9-18 months to actually put in a ticket, but, why leave something for tomorrow, when it can be done today? Please share your return stories in the comments. Reselling is a great way to generate points, miles, and meet minimum spend. Fulfillment by Amazon makes reselling much easier, because Amazon takes care of most of the heavy lifting. Of course, there are a lot of ins and outs to understand about Fulfillment by Amazon (FBA) to really get the greatest value out of it. This posts discusses the things you need to know about shipping into Amazon. I’ve written about shipping in the past, here , here and here, but, it really is a pretty big part of working with FBA. Of course Amazon loves to make changes. A lot of things factor in to how things go with shipping. It’s one of the costs I try hard to cut down. One way, is that Amazon will allow you to send multiple products in the same shipment, which in turn reduces the cost of shipping per item. This is where things can get complicated, and where there are some workarounds, so despite me trying to avoid arrows, I’ll walk you through how to do this. This can get complicated (it took me a few times to get it right), so bear with me on the bullets and such. This is where you’ll start to see options. Easiest option is to select the individual products. Set the number of each item that you are sending. Click continue. Going with case packed can be a bit more convenient when trying to ship to one location. Set the number of units in each case and the number of cases you’ll be sending in then click continue. Next you’ll see a prepare products screen, it you need to bubble wrap or do anything special for the items in your shipment this is where Amazon will tell you. Otherwise click continue. For non-commingled products you or Amazon will need to label the products. I highly suggest going non-commingled, because you control the inventory, and if you have returns it should be the item that you sent in. If you want to let Amazon to label for you there is a small cost ($0.20 per label). Review the shipment. 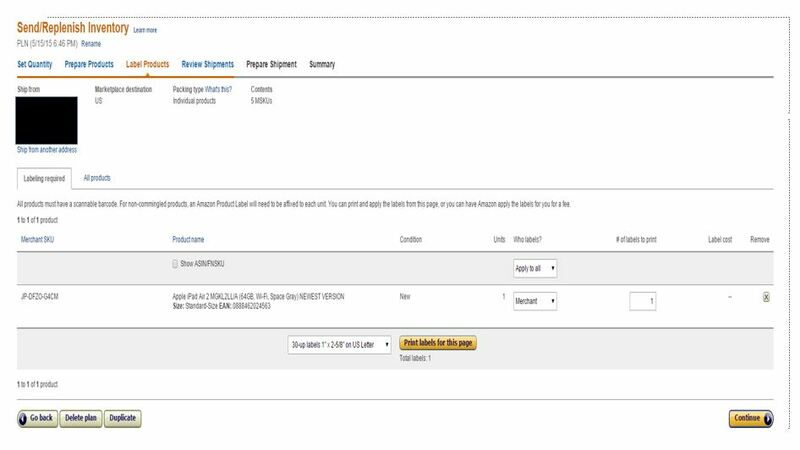 Amazon might tell you that you need to send to multiple locations if that happens, Amazon will show multiple shipments and the number of units & MSKU’s for each one. If you click on the view shipment contents it’ll list the items and quantity of each for that shipment. In some cases, you can avoid multiple locations by opting to label products on your own or not having over-sized items. Click on approve shipment and you’ll see the approved shipments. Click on “Work on Shipment” for the shipment you want to work on. I’ve yet to change anything in the the review shipment contents or shipping services, so I’m going to skip on down to #3 Shipment packing, however if you really wanted to, you could modify the units shipped, although I think Amazon limits you to changes less than 5% of each individual item, or 6 units (note: fixed thanks to MMKate). If at all possible try to get everything in one box or one SKU per box. Don’t worry about the number of boxes as amazon charges for the shipment based on the total shipment weight. You just need to set the weight for the “Everything in one box” option. For the “One SKU per box” option you need to set units per box, number of boxes and box weight. Both are pretty easy and straight forward. The last option of “More than one SKU per box” get more complicated. As you box and weigh them you need to keep track of what you have put in each box. You’ll set the box weight for each box then will be asked to upload the pack list. I’ll go into this in a later post as it is a bit time consuming. But briefly, you can do one of two options. You can download a packlist (it downloads as a .csv, so right click, and open with Excel for ease). 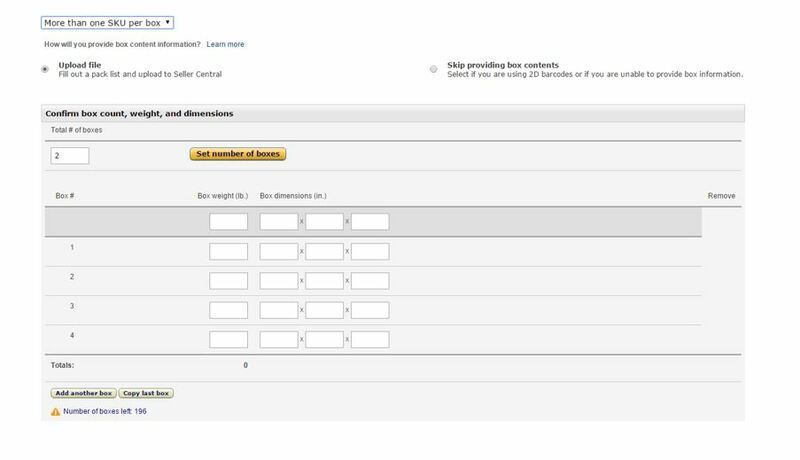 The other option, is populating what is in each box, through Amazon’s on screen system. Again, I’ll have a more detailed post on this coming soon. For this example I’ve gone with the everything in one box option and entered the weight. Once the weight is entered click “confirm.” Then in Shipping charges click “calculate.” Amazon will calculate the cost and you will be asked to approve the shipment. Then you can print the box labels. 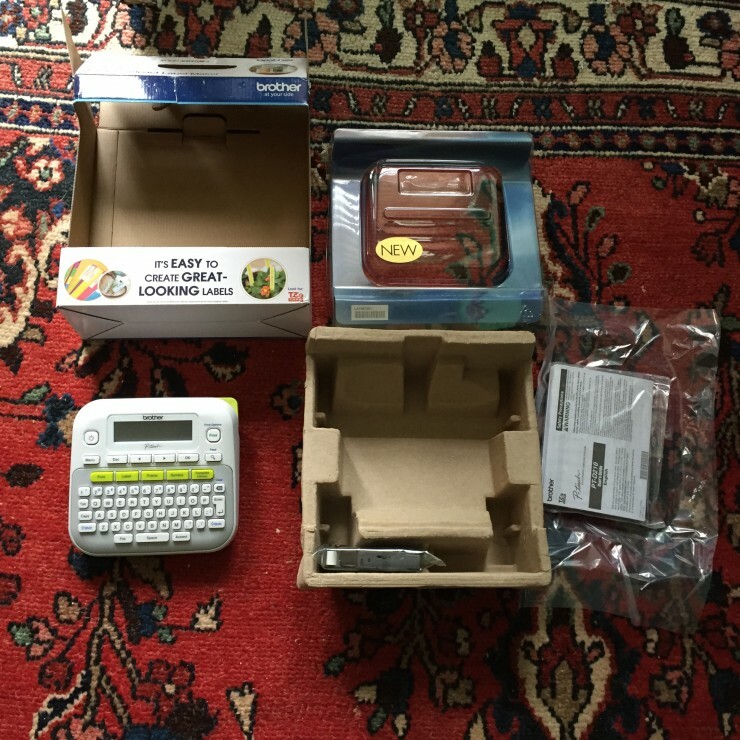 Once you’ve printed the label click on the complete shipment. After you’ve completed the shipment, you see a summary. You can return here to track your shipment.